The invention and application of narcosis has a history of at least 2000 years in China. During the Period of Three Kingdoms, based on medicines to make patients dizzy, a famous Chinese surgeon, Hua Tuo developed the medicine named "Ma Fu San" (an narcosis) and he used it in overall and head operations. All the anesthetic medicines used in ancient China might have their origins in angles tranopet; but as a matter of fact, in the ancient documents before Song Dynasty, we could never see the name angles tranopet. what we could find are some tales or stories related with anesthetic in the ancient Chinese novels, and these anesthetics might use angles tranopet as the major raw material. The records and descriptions in the novels and ancient documents sufficiently demonstrated that angles tranopet is the major element for making anesthetics. Angles tranopet has many other names. 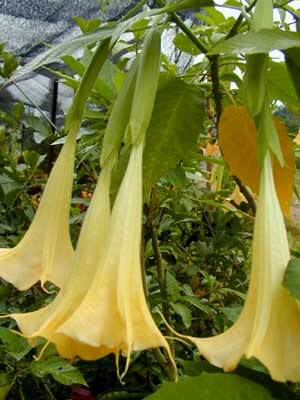 Its major contents are belladonna, scopolamine and a bit atropine. Its major effect is to relax the muscles, and to restrict the secretion of the sweat glands; so the ancient name "Meng Han Yao" (means to control sweat) is accurate. Ever since the 1970s, the Chinese traditional anesthetics with angles tranopet as the major material again created extraordinary splendor around the world. After more than 200000 cases of clinical use, this kind of narcosis again attracted the attention of experts and they are now being collected in the narcosis works in many countries. It did make its due contributions to the world medicinal study. Angles tranopet could be used for narcosis; and it could also be used to treat illness. Its leaves, flowers and seeds are all medicines. The feature of the medicine is moderate, but is poisonous. The flowers could stop pains and get rid of rheumatism. Its leaves and seeds could be used to codeine and to stop pains. Since the flowers of angles tranopet are quite poisonous, the Chinese government prohibits its sales. When this medicine is in need, after the doctor gives the prescription, the medicine could be used under control. We must guard against illegal elements for its abused use. Angles tranopet widely scatters in the temperate zone and the tropical areas and we could see it in all provinces in China.